Our business is locally-owned & operated, serving local-area businesses with pride. We are a certified women’s business enterprise (WBE). Our firm has been providing staffing solutions since 1999. We perform comprehensive resume analyses and in-depth skills verifications. Since 1999, Key Technical Resources, Inc. has been the premier technical support employment agency in Fort Lauderdale, FL. We are a locally-owned and -operated company, dedicated to providing our clients with the best possible workforce solutions. We meet both temporary and permanent staffing needs. Though we specialize in staffing IT candidates, we also place skilled workers in other positions, including sales, marketing and general management. Key Technical Resources, Inc. has been placing highly qualified candidates in permanent and temporary technical support jobs for nearly two decades! We are a staffing agency in Fort Lauderdale, FL that strives to build meaningful, trusting relationships with our clients. 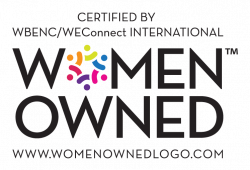 As a certified women-owned business, we are able to connect with a diverse range of candidates and clients, finding the ideal applicant for each and every open position. We offer both direct hire and flexible staffing solutions, ensuring even the most challenging staffing situations are handled easily and effectively. Client satisfaction and successful candidate placement are always our top priorities. Address your company’s staffing issues today. Contact Key Technical Resources, Inc. to learn how we can help you address your staffing challenges with qualified candidates. Key Technical Resources was established in 1999. 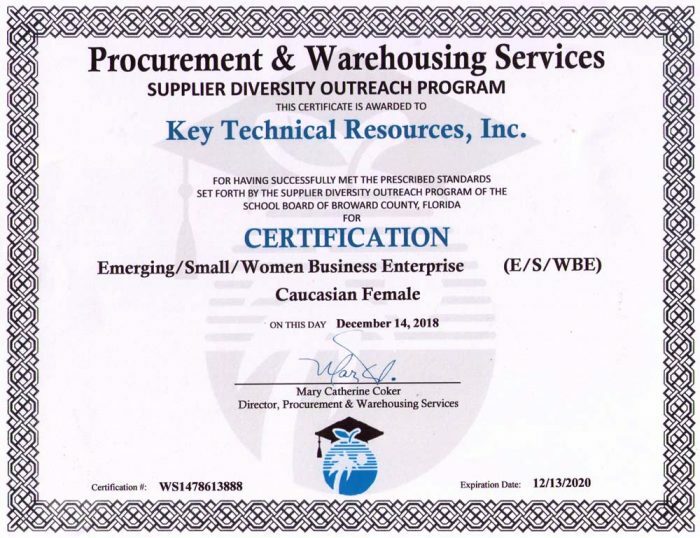 We are proud to be a Nationally Certified Women’s Business Enterprise, and are registered as a preferred vendor with many national corporations in their Supplier Diversity Program, including, Burger King, General Dynamics, Office Depot, Ryder System, Inc., Florida Power & Light, South Florida Water Management District, Broward Health, Broward County, City of Miami, Miami-Dade Schools and the School District of Palm Beach County. At Key Technical Resources, we understand the complex needs of your information technology department or project. Our clients have recognized that outsourcing their search to our professional recruitment managers is the best use of their time and money. Key Technical Resources is committed to excellence in IT staffing and to long term relationships with our clients. To provide clients and professionals with a comprehensive range of assistance to ensure their continued success in the ever-changing and growing technical and professional industry. Key Technical Resources has built a reputation for providing quality services in an efficient and professional manner. With over 30 years of experience in the recruiting industry, our team excels at understanding a client’s needs – from the detailed skill level to the organizational, environmental and cultural levels. This partnership results in matched business capabilities and satisfaction for both the client and the placed professional. Our business was named one of the Top Women-Owned Businesses of 2018 by the South Florida Business Journal. 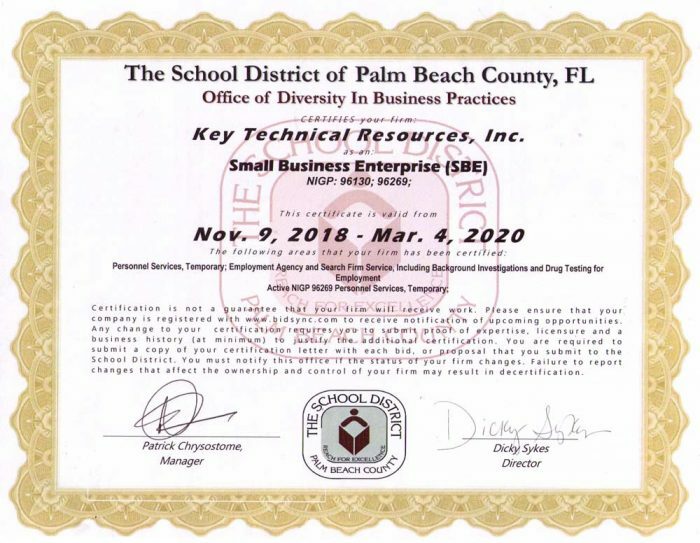 Key Technical Resources, Inc. is certified as a Women’s Business Enterprise (WBE) through the Women’s Business Enterprise National Council (WBENC), the nation’s largest third party certifier of businesses owned and operated by women in the US. We recognize the commitment to supplier diversity that is embraced by corporations and government agencies today, and we can add diversity to your supply chain. Key Technical Resources, Inc. provides staffing services; call us today!